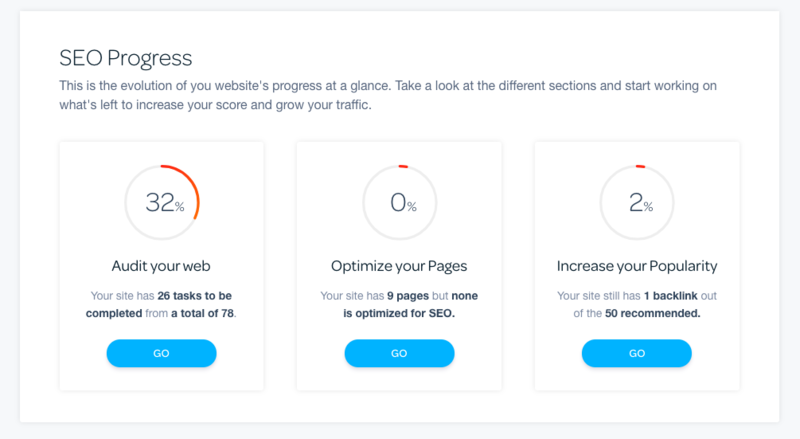 MarketGoo Score measures your rank in terms of website success and it is determined by a proprietary algorithm that calculates your site’s performance on a large number of factors, both external and internal. These factors are weighted differently and include, among others, the number of visitors, backlinks, how mobile friendly it is, etc. The score is not a measurement of your progress in the tool, even though your work can be slightly reflected, it is and indicator that compares your site with the market. Because to stand out the competition, you will have to look after your site on a regular basis and due to the work accomplished, your site will improve its rankings and therefore the score. How you should look at it? You should analyze the evolution of your score as a performance indicator in the mid to long term. Major score changes should warn you about significant issues in your site. It is also very useful to compare the score between your sites to detect what is working or not. You should not expect to see an increase on the score just because you completed all the tasks provided, as said before it relies on your site's performance. And you should take into account that not all websites are the same. The score varies a lot from a starting personal blog to a consolidated business site. It's not fair to compare their performance so you should adapt your expectations to the typology of the site and work with ambition to improve your the rankings, no matter the case. Learn more about all the metrics MarketGoo offers you.